As we informed a few weeks ago, the French Rugby Federation (FFR) announced the winning bidder for their new massive development in Ris-Orangis (just outside of Paris) on February 8. A stadium for 82,000 people with retractable roof and mobile pitch is to compete with Stade de France to host large events. This opposition to existing national stadium came after rugby officials were very unhappy with the way they were treated at SdeF. After months of tender works 3 finalists were selected from 21 entries. Then dialogue between FFR and the design teams was to enable the final selection. The teams consisted of global giants with French counterparts – Populous & Ateliers 2/3/4, HKS Architects & Arte Charpentier and Foster and Partners & Regembal Architecture. The winning bid (above) has been presented at StadiumDB.com already on selection day, so now it's time to give you the runners-up. Unlike Populous, the team created a more conventional, simple and harmonious form with oval bowl encircled by a tall 'crown' that serves as both the decorative facade and support for dome-shaped roof. From a spectator's perspective the roof seems a lot lighter than with Populous' work, also allowing more sunlight to enter the stadium. Seating layout is surprisingly similar to the winning big or... MetLife Stadium in New York. Two large tiers for regular seats are divided by a series of premium balconies. Interestingly, the giant screens have been placed at the premium level, not above all stands. Three dynamically aligned rings compose the external cladding, divided by narrow glazing. 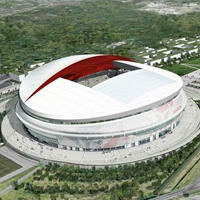 A calm , but monumental form is dominated by the huge dome with only contrasting element – the red wall of the roof. Since only renderings of the exterior were presented, we know little of the inside. Precise layout isn't known, though we do know that the stands feature the 'la ola' effect (or, more simply, they're wavy – taller alongside the pitch, lower in the corners).